Rotating the light switch turns the lights on and off, regardless of the position of the ignition switch. Push the lever forward until you hear a click. 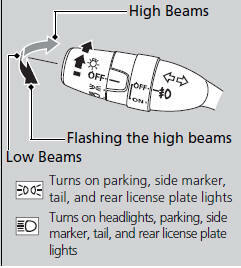 When in high beams, pull the lever back to return to low beams. Pull the lever back, and release it. If you remove the key from the ignition switch while the lights are on, a chime sounds when the driver’s door is opened. Do not leave the lights on when the engine is off because it will cause the battery to discharge.